For those who could afford it, the European diet grew sweeter during the 18th Century as the use of sugar became more widespread. This exposure to sugar meant more instances of tooth decay. These dietary changes were a major factor in the development of dentures. Dentists began to experiment with ivory in order to create a better foundation for dentures. Due to advances in technology, dentists could also add gold springs and plates to the new dentures. False teeth were a novelty that was mostly unheard of in earlier centuries. Previously, problematic teeth were pulled but almost never replaced. Ivory dentures were popular in the 1700s, made from natural materials including walrus, elephant, or hippopotamus. 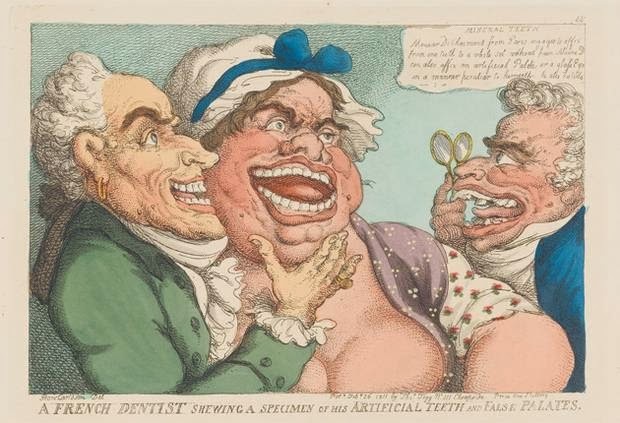 For the wealthy, human teeth were high in demand as the preferred material for the creation of dentures. However, the teeth used in 18th Century dentures eventually rotted. There was a high demand for teeth that were deemed healthy, such as from criminals.